After giving them some time to write independently and then to discuss their thoughts with a partner, we then discuss this material as a class. It’s a chance to solicit ideas from a range of different students, and I feel more comfortable cold-calling students who might be more quiet because I can always just ask them to read what they wrote. We spend some time on each column, filling in the details. 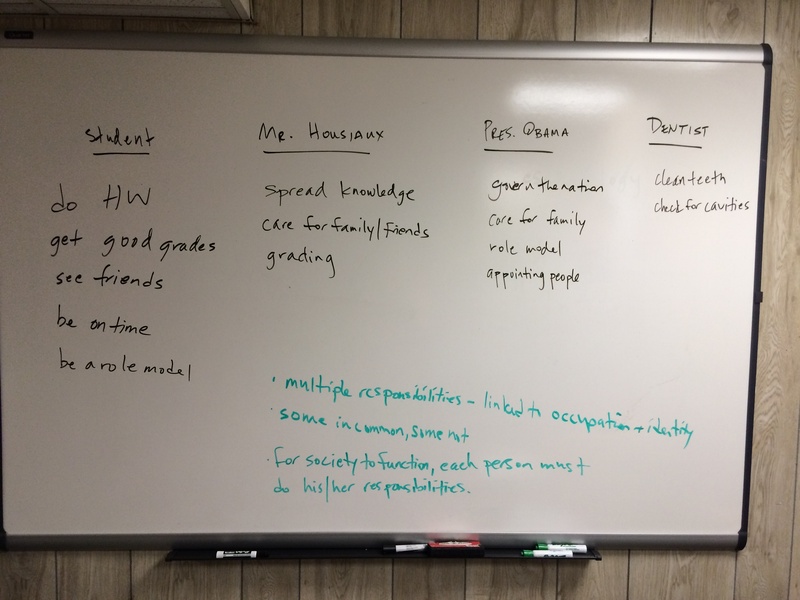 After we have filled out the chart, I then ask the students to look at similarities and differences in responsibilities between these individuals. Note: I still haven’t used the word dharma yet, and they haven’t otherwise been exposed to it – this is one of our very first lessons in Hinduism, as early as the first day. We then spend some time discussing the implications of these ideas. There are certain responsibilities in common that people generally have: to act in a way that doesn’t harm others, to care for those in our communities (family, friends, those younger than us), to respect those who are our peers and our elders. Yet, in this ethical system, these responsibilities are not the most paramount; instead, it is the particular ethical responsibilities that have the most weight and are ultimately the most important. At this point I introduce the concept: the Sanskrit term for these responsibilities in Hinduism is dharma. We spend much of the rest of our time studying Hinduism trying to understand dharma — and its subtleties. At this point, I sometimes take a break to talk about the human body and compare it to human society. Look at the lungs, or the heart, or the liver: they all have general responsibilities (be a part of the body, get along well with the other parts of it), but what is most important is that they do their specific responsibility. The lungs have to do the lung dharma, the heart the heart dharma, the liver the liver dharma, and so on. If they do not do that, the human body (a community of parts and organs and so on) will not function well. And so it is for us humans. We have a particular dharma that we must do, and in order for society as a whole to function, we must do that dharma. If my dharma were unethical, would I still be obligated to do it? Such a great question! And one that gets at the complexities of dharma very well. I met with this students a day later and was able to talk to him about it in more detail: what if a soldier were asked to kill civilians, he asked. Isn’t that part of their dharma? My response was this: Hinduism (in the Bhagavad Gita and elsewhere) does place great emphasis on doing one’s dharma. This can – as in the case of Arjuna, a soldier – involve killing. But the fact that it’s Arjuna’s duty to kill other soldiers in this war does not mean: 1) that it’s his duty to kill anyone or 2) that I can kill anyone or 3) that Hinduism justifies killing. It’s not that simple. The dharma of an Asian Religions teacher is very different from the dharma of a warrior. In many ways, then, the premise of the student’s question needed to be questioned. In a dharmic/duty-based/deontological ethical system, doing one’s duty is itself what makes an action ethical. The question had an unspoken premise that there could be a conflict between doing one’s dharma and doing what is ethical; I would argue that in this ethical system, those two terms should be understood as having the same meaning. From a different ethical perspective – such as that of Jainism, with its adamant insistence on non-harm toward all life, human and non-human – the exterminator’s actions (and Arjuna’s) are completely unethical. Why? Because the highest good in this ethical system is non-harm — no matter what. But that’s not the conclusion we get from the Gita; that’s not Krishna’s teaching to Arjuna (and to us). This entry was posted in Hinduism, Lesson Plans and tagged Bhagavad Gita, Charles Barkley, dharma, ethics, Hinduism, Jainism, Krishna, lesson plan, teaching by teachingasianreligions. Bookmark the permalink. Hi, I’ve been stalking your blog a bit this afternoon, the truth is, I’ve been looking for something like it for a while. I really like this approach to starting a unit on Hinduism, and wish I’d found it just a few weeks ago. I teach a high school course in Durham, NC and it’s nice to find approaches that are both relateable and accessible for my students but also challenge them to think about the complexity of these ideas. Thank you! Thanks for your kind words above! I always appreciate the chance to hear from a fellow educator. Readers, check out Kate’s blog as well: http://desksanddeities.wordpress.com/ Lots of valuable insights there from what I’ve been able to read at a quick pass. I hope we can continue this exchange of ideas!